Two paintings, by two different painters; they currently hang in the same room at the National Gallery in London. One was painted in 1640 in Haarlem, The Netherlands. The other was painted four years later in Amsterdam by an artist who was born in Haarlem. in those days Amsterdam would have been just a couple of hours away by horse-drawn barge. One is painted by Frans Hals (1582/3-1666), the other byBartholomeus van der Helst (1613-1670). 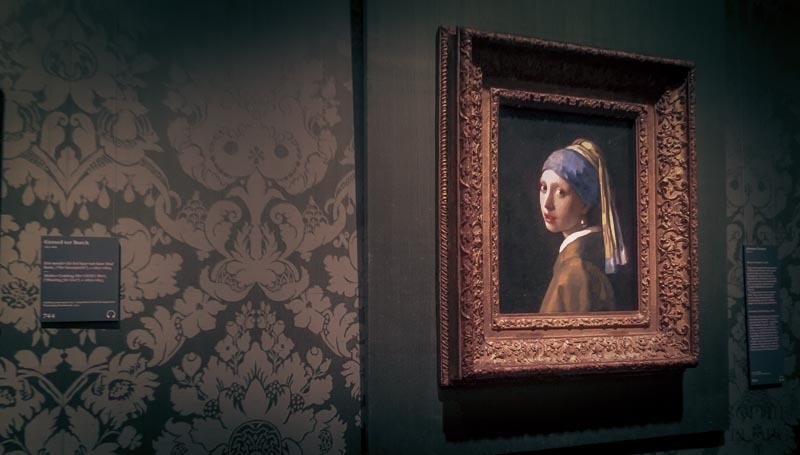 Both paintings depict a similar scene: a young woman in a beautiful dress with a large lace kerchief around her shoulders. The dress and pose in both paintings is near identical. But the high fashion of the day was painted in very different manners indeed. I love the idea of hanging these two paintings in the same room. In fact it would have been great if they were hung side by side. So let’s do that just for now. Bartholomeus van der Helst, Portrait of a Lady in Black Satin with a Fan, 1644, 104.6 x 76 cm, © Copyright The National Gallery, London. The clothing makes the portraits instantly recognisable as Dutch old master paintings, and thus perhaps from a completely different world than ours. We could dismiss them as such; as no longer having anything to do with us. As women who are wearing funny clothes. Yet if we take a moment to look at the women who are wearing these clothes we instantly recognise us in them. They are both non stylised and real faces of young women, looking at us patiently; one a little amused, the other more holding back. These are real human flesh and blood people, with thoughts, feelings, a past and a future. They could be our ancestor if we just stop to imagine for a second. 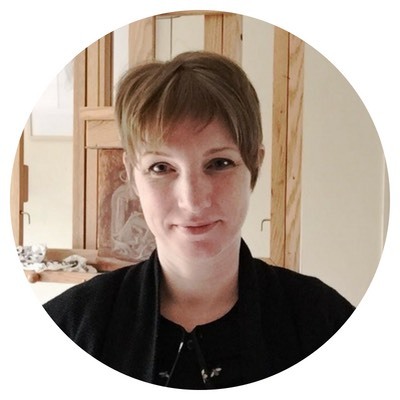 And when we realise that these women actually walked the cobbled streets of Haarlem and Amsterdam, they had children perhaps, they married, they had interests and duties, they lived. It is not known who they were. And yet they look so different. Not because they are two different women, but because they were portrayed by two different artists who actually had a lot in common. 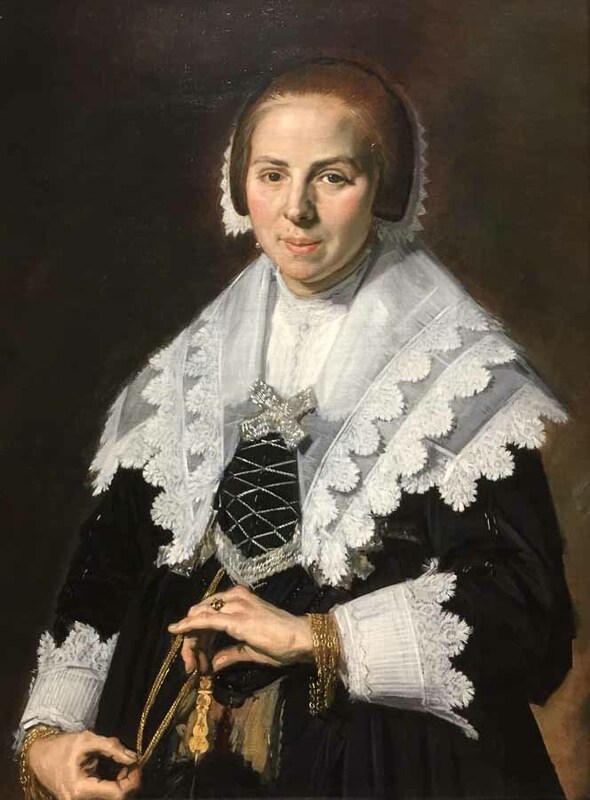 Frans Hals and Bartholomeus van der Helst were both hugely popular portrait artists in their respective cities. As small a country as The Netherlands is, they will have known eachother’s work, perhaps even have known eachother personally. 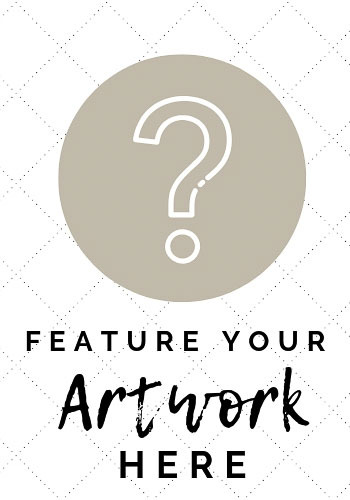 As they worked in different cities, and clients would usually find a portrait artist within their own city, they were probably no competition to each other. It is amzing to see how two artists, Hals 31 years older than Van der Helst, yet both popular and active in the middle of the 17th century; how two artists can have such a different painting style and yet enjoy such success. 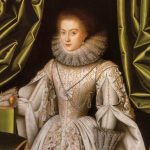 Clients certainly did have a choice in those days as each city offered numerous portrait artists of high quality to choose from. As always taste is personal and so both Van der Helst and Hals could build up a highly succesful portraiture business alongside many colleagues. For us, centuries later, it is fascinating to see how the same subject matter is treated by two different artists working at the same time in the same culture. Neither is the odd-one out. Rembrandt and Hals were both working in a bold and painterly style. Verspronck’s work became more painterly in his later years. Van der Helst and Ter Borch and many others had a more refined and delicate approach to their portraits. And both styles could exist side by side, highly aware of each other, serving their own client base in their own cities. We all know Frans Hals’ painting style as vigorous and bold, expressive and lively. I have little doubt that his work appeals to so many of us in the 21st century because we have enjoyed modern art developments. We appreciate the rawness and associate it with character and emotion. Yet Hals had not heard of van Gogh’s bold brush marks, let alone of expressionist mark making, even though we can perhaps see similarities. Still we can ‘use’ history for our own pleasure and aims and enjoy Hals’ vigorous brush strokes at our own leisure. And how lively she is. It is unknown who is portrayed exactly, but she has a presence that is undeniable. A faint smile around her mouth and a peculiar way of holding her fan. But look at that hand! 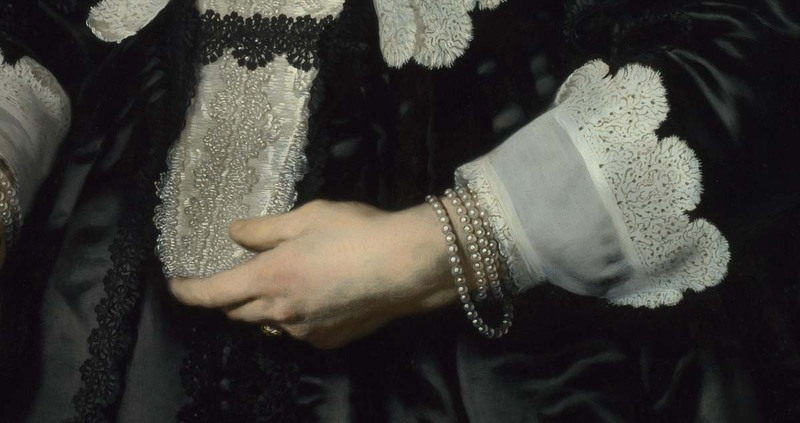 How fantastic did Hals put all those brush marks together to form those fingers so delicately holding the fan. That highlight on the thumb especially does it for me. 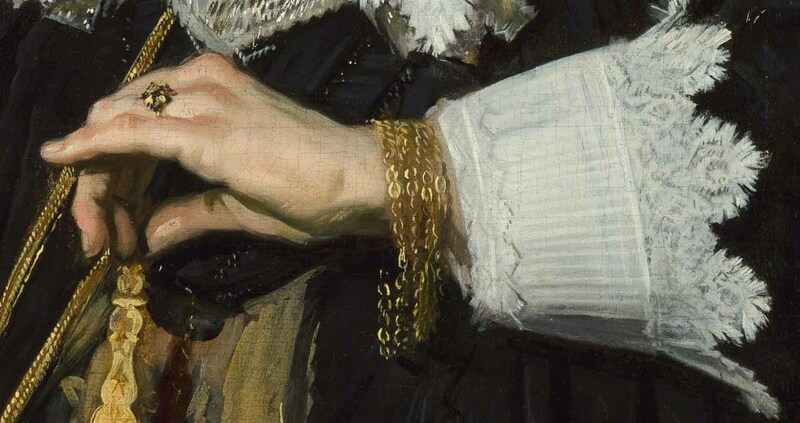 But Hals is no lace painter. Although the scallooped lace is fluffly at the edges I find the lace fairly flat. There is very little shaping or shading and only a hint of pattern going on. The lace is thick and white and bold. But the lace would not have been thick and bold in reality. It would have been thin and delicate. Bring on Hals’ contemporary Van der Helst in Amsterdam. His lady is draped in the most delicate and finest of scalloped bobbin lace. The edges don’t feather like in Hals’ depection but they fray. The edges fold over and up here and there, the scallopes create a faint shadow on the layer of lace underneath. In the cap and the cuffs the lace has a gentle fold, shown by a little shadow running over it. The cap recedes beautifully into the background. Creating a receding depth in a piece of lace is impressive if you ask me. The pattern of the lace is not exactly depicted thread by thread. 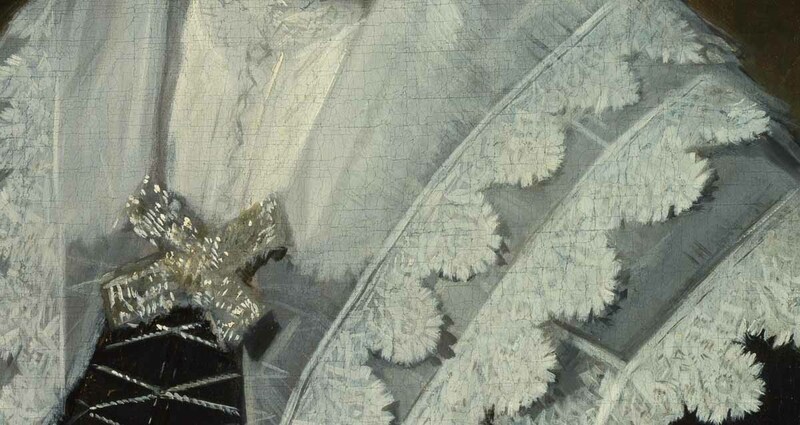 The negative space (the dark peeping through from underneath) is loosely drawn with a thin brush with darker paint on top of the white paint. Some dots and lines hint at the repeating pattern. There is enough repeat to recognise a pattern, but there is enough looseness to keep things lively and varied. The brush strokes are almost invisible here. It is painted in such a delicate way I could look at it for ages. Rembrandt van Rijn, Portrait of a woman, possibly Maria Trip, oil on panel, h 107cm × w 82cm. Rijksmuseum Amsterdam. And then there is Rembrandt (1606-1669) of course. 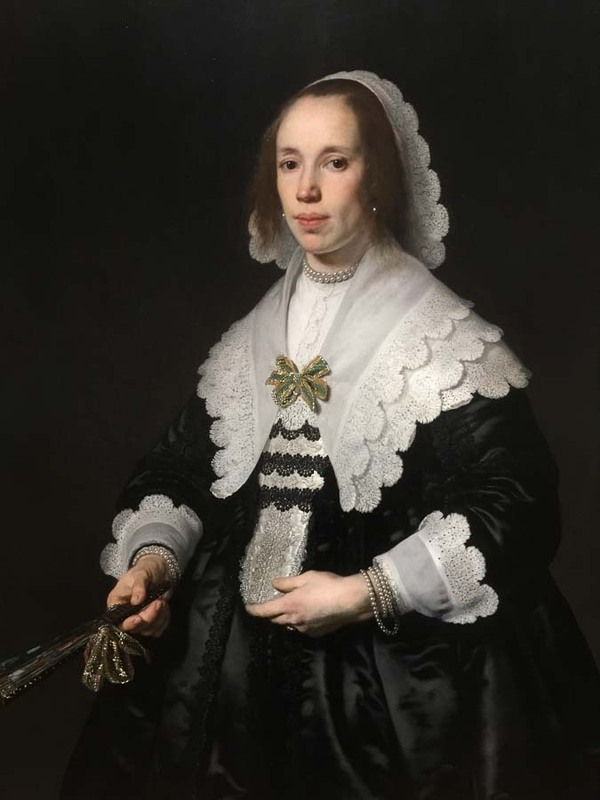 His portrait of Maria van Trip shows a lady in a very similar pose, with similar clothes as the portraits by Hals and Van der Helst. This was painted in 1639, so only 5 years before Van der Helst painted his portrait and just a year before Frans Hals did his. 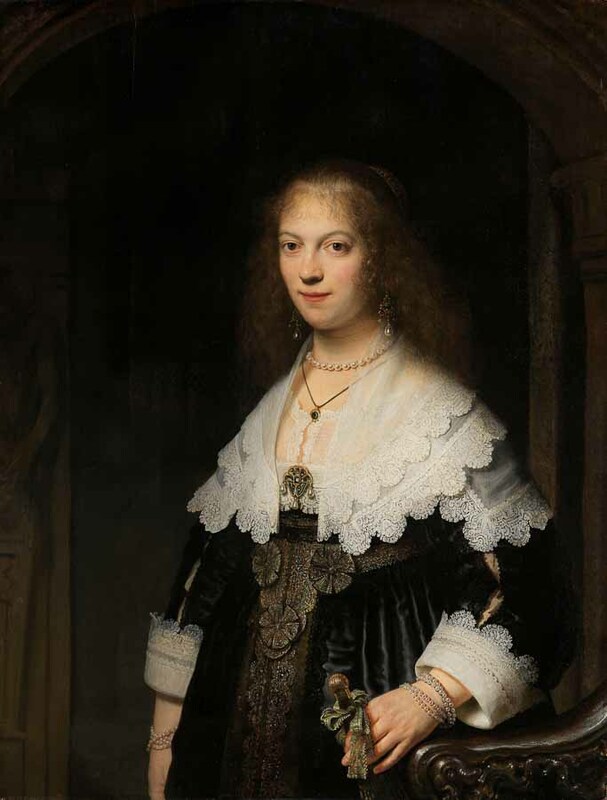 Rembrandt and Van der Helst were both working in Amsterdam and in direct competition with each other. Rembrandt paints with enormous drama: the paint is thick and the lighting is theatrically strong in contrast. 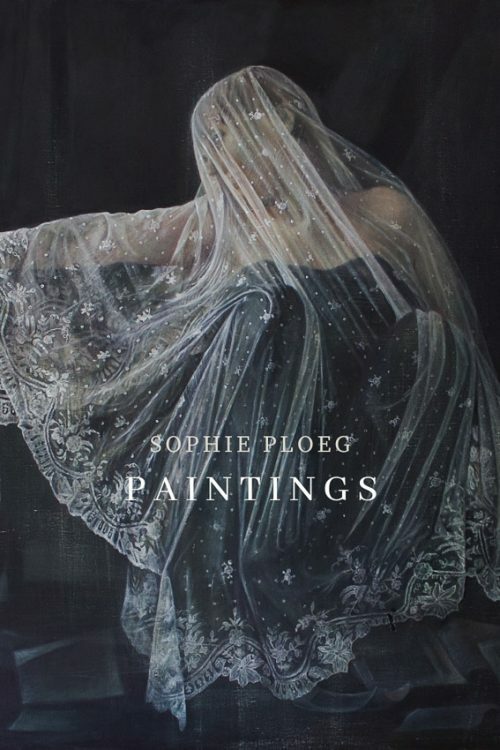 The white lace beams out of the picture that is otherwise predominantly dark and atmospheric. Who can resist a drama such as this? 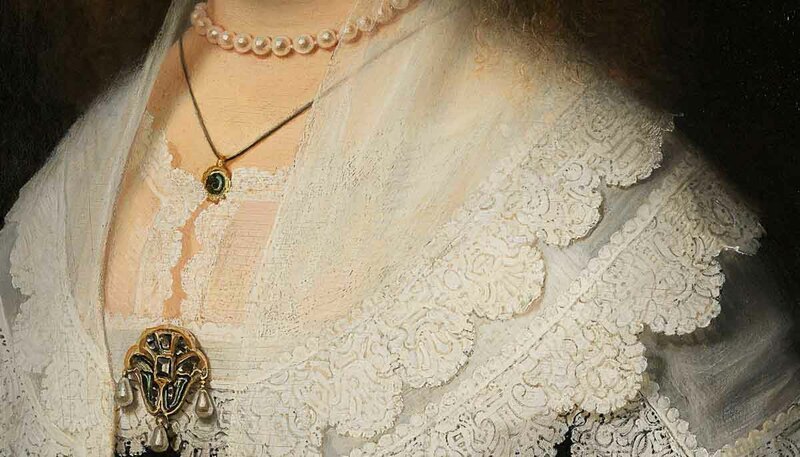 Rembrandt’s lace is beautifully shaped; subtle shadows under a lifted scallop, the gentle fold of the kerchief standing slightly proud of Maria’s neck; the faded patterns in the receding areas, and the clear and sharp edges within the lace that is nearest to us all enhance the 3-dimensionality of it. Rembrandt is working it big time. The cuff is precise and clear, attracting our attention. The other cuff, half hidden by Maria’s dress is muted and soft. Maria’s shoulders and arms are receding into the shadows; there are few clear lines here. All attention is at the centre: her friendly face, lace, jewels and dress. The black silk has been left unassuming and simple. All three portraits were painted within a 5 year period and less than 20 miles apart. The similarities between the portraits are overly clear. 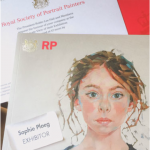 There was obviously a fashion going on in portraiture, pose and clothing that proved highly popular. 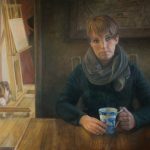 Yet all three painters have a distinct style of approaching the subject matter. Clients had a real choice. I showed my social media friends the Van der Helst and the Frans Hals portraits and asked them which they preferred. 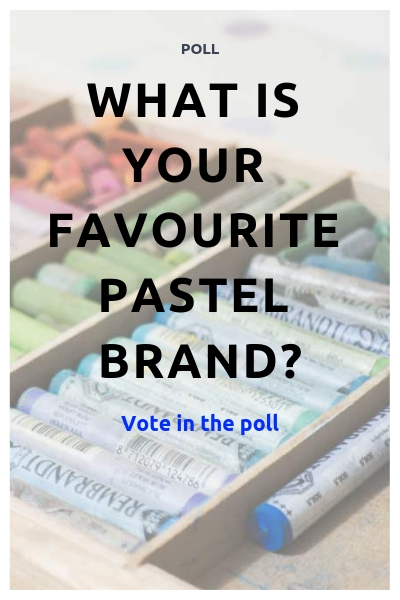 It was no surprise to see the votes were equally divided between the two! 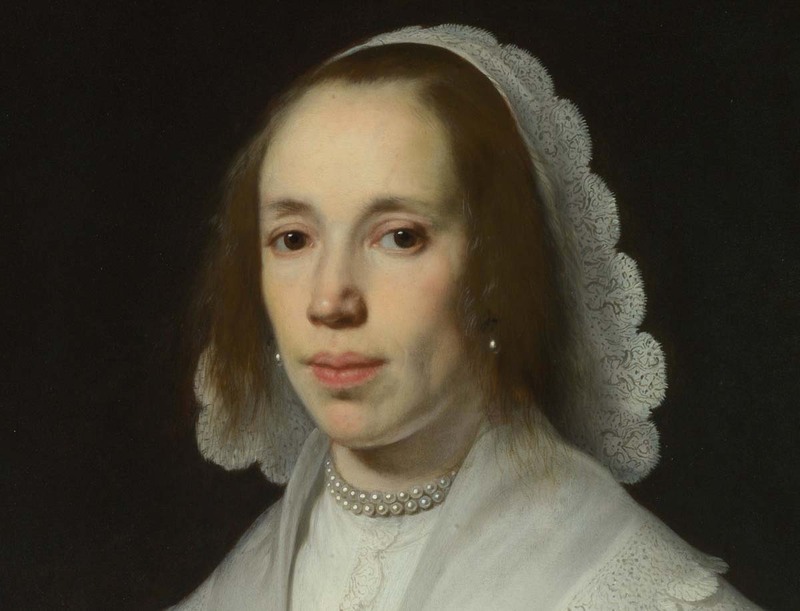 Although I can appreciate the Hals for its qualities in expressing human character, I would vote for Van der Helst for the delicate depiction of lace and silk as well as the subtle and intriguing face of the model. At the end of the day it is all just a clever combination of colours on some canvas. and yet in it I can find stories, mystery and history, as well as inspiration on how to paint myself. Isn’t it just? I love the delicacy and subtle use of shading. spellbinding. Thanks Aaron!